Review by AllTheBestFights.com: 2016-10-14, nice fight with some tough exchanges: Ricardo Rodriguez vs David Quijano 2 gets three stars. Ricardo Rodriguez entered this fight with a professional boxing record of 14-3-0 (4 knockouts) and he is ranked as the No.19 super flyweight in the world while his opponent, David Quijano, has an official record of 16-6-1 (9 knockouts) and he entered as the No.65 in the same weight class. Rodriguez lost to David Carmona last year (=Carmona vs Rodriguez 2) but then he has won over Miguel Cartagena and David Quijano in their first fight (=Rodriguez vs Quijano I). 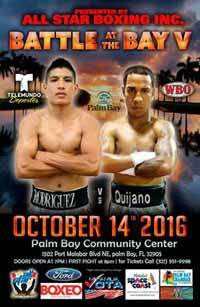 ‘Meserito’ Rodriguez vs Quijano 2 is valid for the WBO Latino super flyweight title. Watch the video and rate this fight!